There is a place in Umbria, the green heart of Italy, that speaks to you with tranquillity and peace......A place where you are embraced by nature and history. Where you realize that above all else, being on vacation means getting closer to yourself. This place is Villa Pian del Rocchio......come and find yourself! San Venanzo, just 20 minutes south of Perugia, you will find Villa Pian del Rocchio. 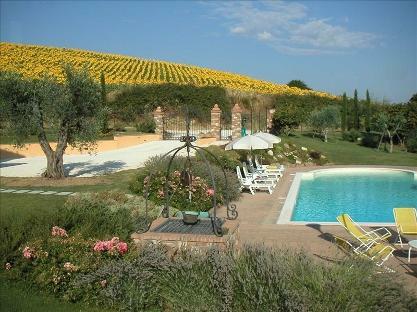 A beautiful holiday rental villa surrounded by a large picturesque terraced garden with pool. 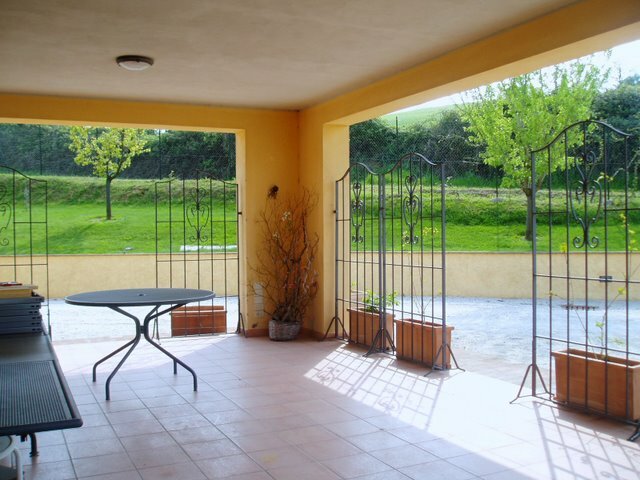 The villa is situated in a wonderful, typically Umbrian green upland plain at 450 meters above sea level, amid gentle hills sloping towards the Tiber River Valley. Villa Pian del Rocchio is a truly unique place, designed to accommodate the interest of the people staying there, to respect their preferences and their wish to stay where they feel truly at ease. 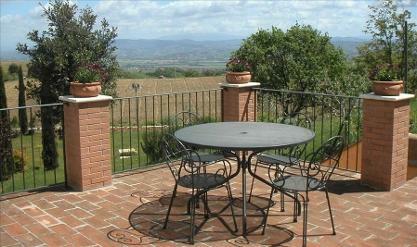 The villa is completely renovated, and is designed in a way typical of the old country houses. 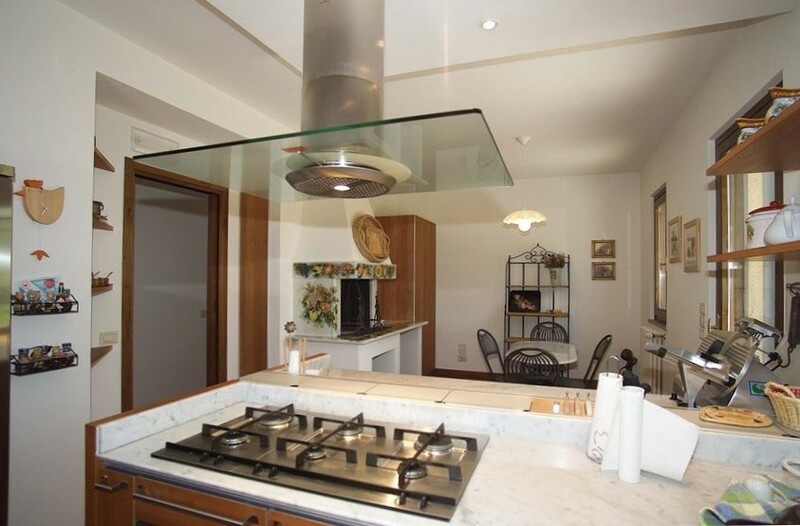 It comprises 5 buildings: the Tower”, the “Hearth”, the “Kitchen”, the “dining room” and the Veranda. The ground levels have floors in Florentine-style fired brick. The doors and windows are in solid chestnut, with roll-up screens. 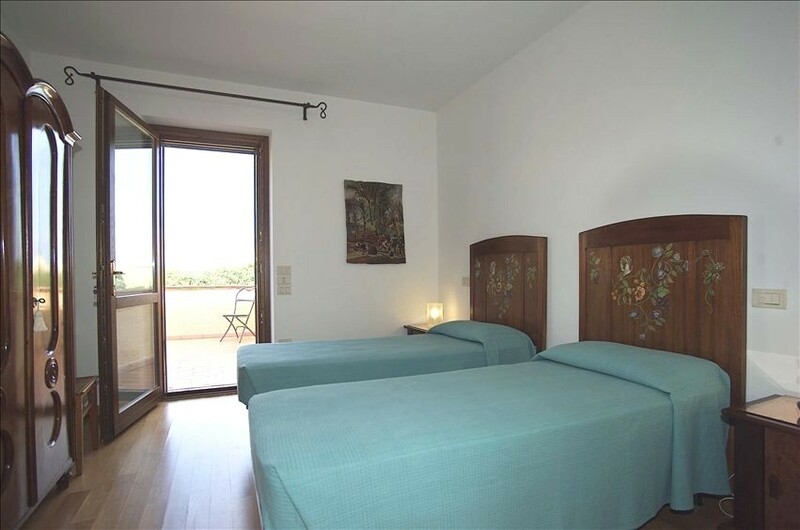 The Villa is furnished with beautiful pieces all restored to perfect condition. Combined with the charming colours of the upholstery and wallpaper, they create a warm, family atmosphere. The whole villa is spacious and filled with light. Lounge/Sitting Room: Furnished with comfortable sofas and armchairs, plus a spacious built-in bookshelf that also contains a stereo system and satellite television. The large fireplace gives ambience, character and warmth. Dining Room: Comprises 2 large windows, one looking out on the garden and the other on the flowerbed with its specimens of antique roses, the perfume from which is delightful. The walnut table seats 10-12 guests. There is a comfortable, colourful "Dormeuse" for a relaxing afternoon siesta in the cool shade of the house complete the furnishing. Games Room: 2 gaming tables (backgammon, cards, bridge board games and bidding box are available) as well as an old-fashioned regular billiards table. Kitchen: Hi-tech kitchen is spacious yet cosy, completely furnished and equipped with a large oven and 6 hob range, a refrigerator/freezer with ice dispenser, a built-in microwave and dishwasher. Veranda: Situated adjacent to the house, is large and cool and has a rectangular wrought-iron table for 12-14 guests for all outdoor occasions. 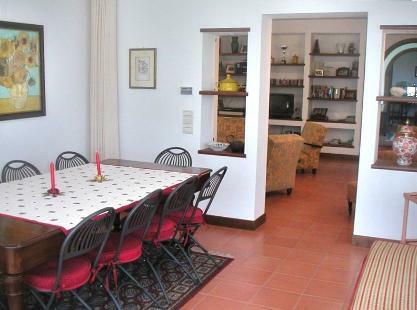 The Villa has 5 bedrooms (sleeps 10) All the bedrooms have warm, light oak parquet floors. Amazingly, each bedroom has its own private terraces/balcony that look out on two small lakes, and offer a splendid view of the surrounding countryside and garden. 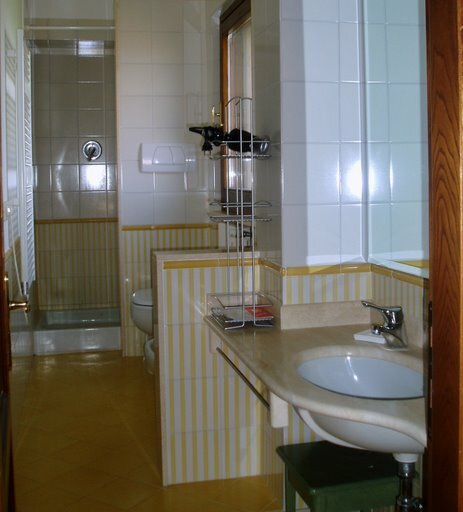 The bathrooms are all delightfully decorated with matching tiles, large showers and ceramic sinks. The marble-lined bathroom has a whirlpool bath. The first floor has 4 bedrooms with 2 en suite bathrooms, two bedrooms contain king-size beds whilst the other two bedrooms have twin beds. Beds can be easily re-arranged to suit guests’ needs. 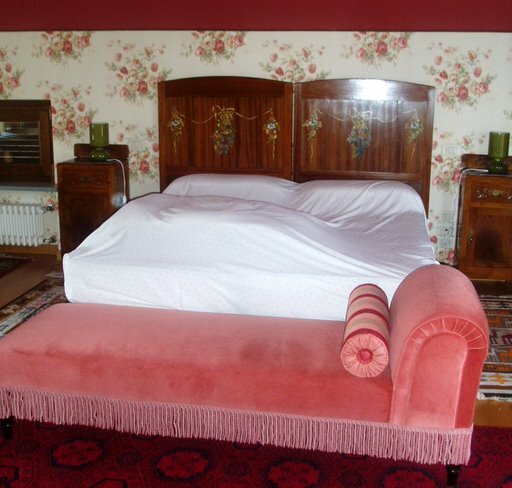 The second floor contains a very spacious romantic suite, with king-sizele bed and en suite bathroom. The Villa has a garden of approx. 5000 sqm, with olive trees and orchard containing almond, fig, peach etc., The garden contains a variety of plants and shrubs. The Pool is 6 x 12 m rectangle. There is an additional semi-circular area of 5 m which contains large shallow steps for ease when getting in and out of the water. The depth of the pool slopes to varying depths from 0.5 to 2.30m) so both children and adults can swim in safety. There is also a hot-and cold-water shower, near the pool. The sunbathing area, paved in terracotta bricks, allow Guests to take the sun at all hours of the day, as they relax on comfortable beach chairs and lounges. A scenic corner, near the well by the pool, includes a round wrought-iron table with umbrella and a charcoal barbecue for tasty grilling in the cooler evening hours. The tranquillity and well-being that the house offers are in close harmony with the variety and beauty of the surrounding area. From the Villa, easily reachable within 15 – 45 minutes are famously unique places renowned for their history and beauty such as Assisi and Gubbio, splendid Medieval cities like Todi, Foligno, Bevagna, Montefalco, Spoleto, Orvieto and of course Perugia and not forgetting Lake Trasimeno. Guests can enjoy the flavours of a land whose culinary tradition and fine wines are another major source of pleasure for those who visit. 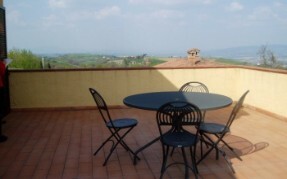 From Villa Pian del Rocchio you can reach Siena, Florence and Rome in no more than 2 hours travelling by car or train.